Lincoln Griffin (19) gets set for a second period face-off. 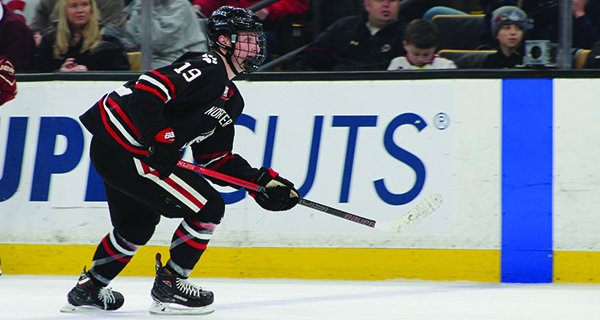 Last season, Northeastern broke their 30-year Beanpot drought with a 5-2 victory over Boston University to claim the school’s fifth-ever tournament title. On Monday night, the defending champ and No. 13-ranked Huskies took to the TD Garden ice to defend their crown against rival Boston College. Leading the Huskies on Monday was a familiar face to those from the town of Walpole in senior forward Lincoln Griffin. Playing in his final-ever Beanpot with NU, the Thayer Academy product put on an absolute clinic in a 4-2 NU victory. Griffin scored the would-be game-winning goal 1:25 into the third period and notched a pair of assists, including the game clinching empty-netter by Zach Solow with five seconds remaining. Down the stretch of last season, a big contributor in seemingly every area for Northeastern was Wellesley native John Picking. Unfortunately, Picking, an alternate captain, was unable to suit up for Monday night’s championship contest at the Garden due to illness, but that didn’t stop the Jr. Bruins product from being there to cheer on his teammates from the press box. 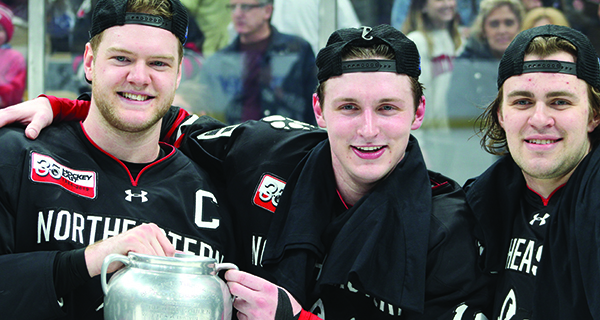 From left-to-right: Eric Williams (C), Walpole native Lincoln Griffin (19), and Canton native Liam Pecararo pose together with the Beanpot trophy after helping Northeastern to its second consecutive and sixth-ever Beanpot championship on Monday night at TD Garden with a 4-2 win over Boston College. Picking, a grinder who plays a physical game and makes a massive impact on NU’s penalty kill, says he hopes to return for Northeastern’s two-game series against Vermont at Matthews Arena on February 15-16. With just 39 seconds to play in the first period, Griffin took the puck behind the net and attempted a wrap-around. BC goalie Joseph Woll (31 saves) sprawled and hugged the post to make the initial save with his glove, but the puck was smacked home on the rebound by Austin Plevy to give NU a 1-0 lead at the end of one. Patrick Shule doubled Northeastern’s lead to 2-0 with a wrist shot up high from the left face-off dot at 17:54 of the second period, as the Huskies carried a two-goal lead into the third. Just 1:25 into the third period, Griffin scored arguably the biggest goal of his collegiate career, picking up a rebound in the slot off of a net-mouth scramble and backhanding home the would-be game-winner up high to give NU a commanding 3-0 lead. BC failed to go down quietly, though, netting a pair via David Cotton and JD Dudek to make it a 3-2 game with 7:46 to play. The Eagles yanked Woll out of the cage for an extra attacker with just over a minute to play, and with 5.3 seconds remaining, a hustle play by Griffin in the corner led to Zach Solow backhanding home the title-sealing empty net goal for the Huskies. The clock hit zeroes and the Huskies mobbed tournament MVP goaltender Cayden Primeau (33 saves) as NU claimed its second consecutive Beanpot title, the first time a team has repeated as tournament champ since 2014 (Boston College, 2012-2014). Lincoln Griffin (pictured) hustles in on the forecheck. With the Hockey East and NCAA Tournaments approaching, every win matters this time of year. In past years - as recently as last season with NU - winning the Beanpot has helped teams turn on that next gear and make a run in both the Hockey East and NCAA tournaments. Getting a guy like John Picking back, who brings that necessary type of grit and leadership to a locker room, as well as having your core pieces on offense (Griffin, Pecararo, Tyler Madden, Patrick Shule) clicking will make Northeastern a tough team to beat come March. Winning the Beanpot is a phenomenal accomplishment, but this team is not even close to being done.